This item has been discontinued by the manufacturer. 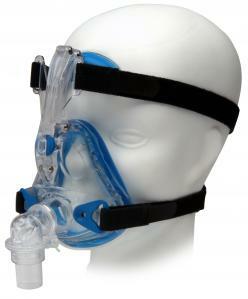 A similar mask is made by Respironics. Mojo's contoured shell follows the curves of the human face and easily bends inward and outward for a comfortable fit. Air leakage is eliminated by adjusting the headgear, as the dual beam element transfers the force of the straps to the center of the mask. SleepNet's proprietary tension wheel fine-tunes the fit. Unique magnetic clips are virtually foolproof. They easily click into position securing the mask and keeping the straps in place. The clips also allow for a quick release of the mask. The SleepNet Full Face Mask, designed using strong, durable and medically approved materials, will easily withstand the rigors of home or travel use. The mask is very high quality, but for a full face like mine it just wouldn't hold a seal when my face relaxed just before falling asleep. I'd say it would work great for someone younger with a firmer face.